The Sketchbook Challenge Blog Hop! Over there I’ve described a little bit of the inspiration and sketchbook work I’ve done that has led to the beginnings of a new series. I’ve spent some lovely time with a few of the thousands of photos from last month’s road trip, lots of lovely time on photoshop, and time in the studio with paint and cloth. 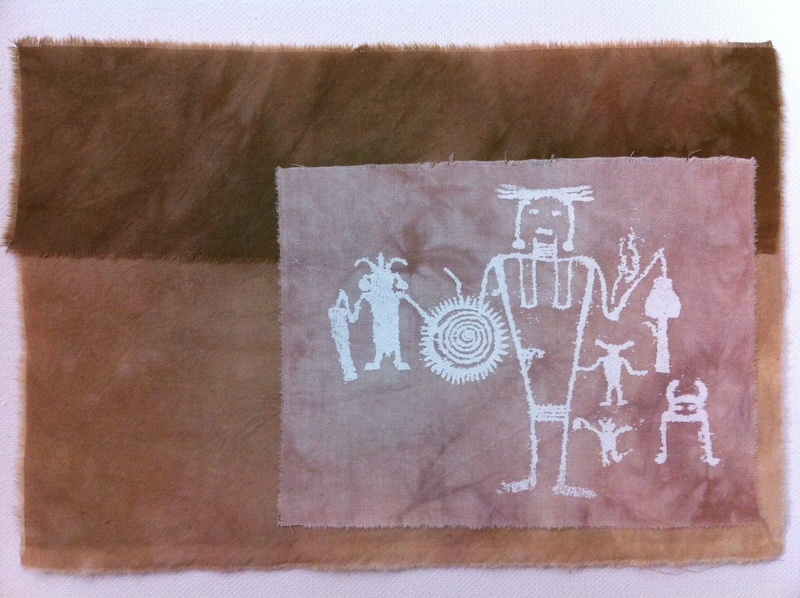 Photos of petroglyphs from Mesa Verde were turned into thermofax screens for some lovely little prints. Lots of stitching still to come. These small pieces will be mounted on gallery wrapped canvas. This is one of my photographs printed onto cloth – not sure where this is going yet. Now for something fun. I’d love to share my love of thermofax screen printing with you! Two lucky winners will receive one large thermofax screen each. You can choose one of my ready made screens or I’d be happy to create a screen from your own image. You could use photoshop elements to create your own image – just follow this tutorial. Leave a comment here by Friday the 20th. Tell me what has inspired you today! Do you use a sketchbook? Do places inspire you too? Yes, I use a sketchbook. I mostly write and do really fast and rough thumbnails in them. I’m always inspired by places I’ve been too. Sometimes it’s small places like the local bakery and sometimes it’s big places like San Francisco. The world is a pretty interesting place. er raar bij het bekijken van mijn apple iphone . Ik ben op zoek naar een thema of plugin die misschien in staat zijn om dit probleem op te lossen. Als u suggesties heeft , kunt u delen . Op prijs stellen! My camera is my sketchbook. I work in all fabric so I have folders with inspirations. I keep multiple pinterest pages. Today the snowfall that is covering my woods is my inspiration. Thanks for this giveaway. I’ve come rather later to art journaling from a textile background and have found it immensely satisfying. 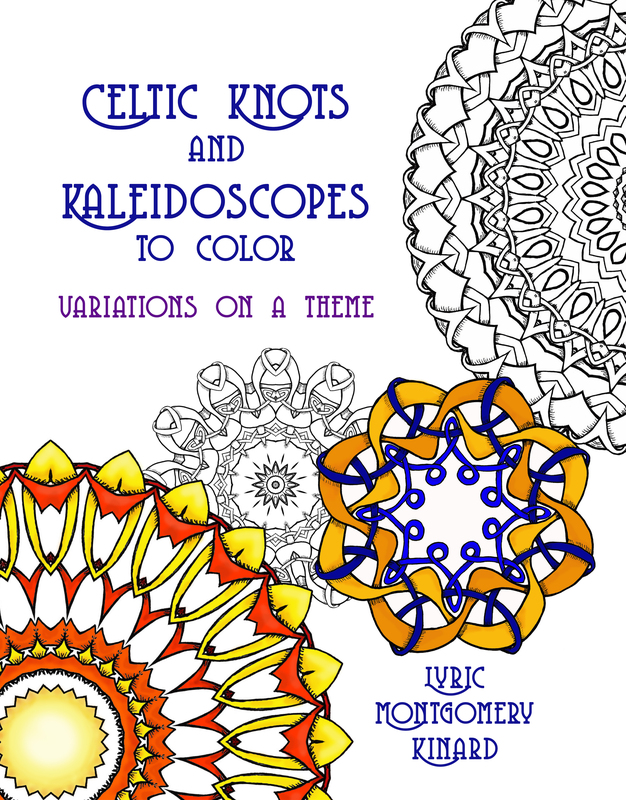 Like most of us, I have a number of books on the go – two in different sizes specifically for sketching/doodling/zentangling and four in various sizes for art journaling, one handmade. Inspiration comes from everywhere – classes, nature, books, magazines, the internet, etc. At present, I’m particularly enjoying creating faces and exploring new materials and techniques. Sketching and journaling are keeping me sane in an insane world! I have several sketchbooks because I can’t keep track of one: in wrong room, left in car etc. Sometimes, I am surprised to look through my sketchbook and see things that I don’t remember and wouldn’t think to do in the present. Having the book format allows me to see the history of my work and inspiration. My inspiration comes from nature and taking lines from common objects and simplify them to shapes that no longer create an identifiable object. I found your book about a year before I had your class. I like trying the exercises when I need a break from current projects. I would enjoy using a thermofax in my work. I want to commit to at least 15 minutes a day. It is the dailiness that I think will grow my work in the next year. I would enjoy using thermofax to expand my use of techniques. 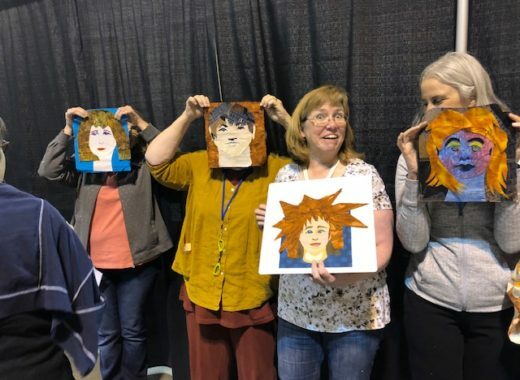 Today I was inspired by many things that I saw at the Georgia Quilt Expo in Atlanta. Especially a group of challenge quilts done by the Chicago Modern Guild based on favorite artworks. The guild members swapped information and made quilts for each other. It was really interesting to see the various ways that the artworks were interpreted. Starting a sketchbook is next on my do-list. My camera serves as my sketchbook these days. I love texture and old worn-out and decrepit things, and am working on translating my photographs into fabric art. It would be wonderful to have a Thermofax screen made from one of my photographs. My camera is my sketchbook these days. I am fascinated with texture, and old worn-out and decrepit things. I’m working on turning those photographic ideas into fabric art. I would be thrilled to be able to turn one of my photographs into a Thermofax screen. I moved from my lifelong home in California to Ohio a little less than two years ago. I have sketchbooks going back 30+ years to college, many with drawings and inspirations and an equal amount of lists. (I love to make lists.) Since moving here, I keep most of my creations in my head, with great detail. I’m still working on getting them out of my head and onto paper. This voluptuous spring day here in Tasmania has totally inspired me today – snowy white cherry flowers, deep purple irises, bees buzzing in the oak tree as well as the wattles and eucalypts – I’ve leapt around with my camera and some of these images will end up in my workhorse – my thematically inspired ‘flowers and garden views’ sketchbook – where I’ll glue some images, draw, subtract, paint, collage and print until the moment comes when I know ‘this can be a quilt’! Just love the process! Art Journal… I mean JOURNALS… I have several, some finished, some not, full of ideas, sketches, some shareable, some not – some reflect growth, and others whimsy! Thermofax screenprinting, thermofax anything is something I’d like to add to my toolbox! Love your blogs, Lyric, always inspiring! I keep a small sketchbook of random drawings based off my daydreams, I use them to write poetry by. Would love a Thermofax screen from your lovely selection. Your work is very inspiring! I haven’t done any real printing on fabric (other than some leaf prints) and have tried to avoid it, because it looks HARD! I love the effects, though–and someday I hope to work up my courage to try it. I sketch ideas, and sometimes get ideas from the doodling. Sometimes my sketches are so vague as to make no sense at all the next day(!) but might lead to something even more interesting. I love your Mesa Verde series. My inspiration today came from a ride down a back country road in MA and a giant field of pumpkins that had just been harvested. Love what you have done. I am using lots of photos of my sister and me taken on our many travels together to make a a special quilt. Have loved using some of the thermofaxes that I already have bought from you. Love the rock studies, petroglyphs and your travel related posts…they inspire and excite each of us. I particularly have learned to create images and drawings from the tips and tricks you have shared, and find that I am using more and more line, form and shape in my new work that is all inspired by you. Would love to add screen work with your thermofax screen to a few of my nearly done pieces…fingers crossed. Thanks for all you do for all of us. I am inspired by the patterns found in every day life. From the ovals in a stack of stones in a river to the elegant lines of stone in the side of a building. I am inspired by these patterns I see in my photos to those I see during my day. I have sketchbooks I use and wish I made more time for them! I use them to just draw or paint, but to also try and capture the thoughts and pictures in my head. Thank you for sharing your inspiration! How fun it would be to win. I like using thermofax screens with thickened dye and with paint. I first used a note book to note inspiration and make little drawings. Now I’ve started to use a small sketchbook (6×6 or 5×7) to do the same, but I’ll add bits of paper/fabric to show colours etc I’m still very insecure about my drawing abilities, but a few words always clarify my drawings. The thing that always inspires me is nature, or noting designs (moss on rock walls, cracks in sidewalks etc) Thanks for the prize opportunity. Hi Lyric, I took your very first class at Quilt U. It started a great journey, and I thank you for offering it. I’d be very honored to win a Thermofax screen from you. My sketchbook is just like me…random and chaotic, with every idea I come up with, often in lists and plans, with notes all over scribbled as fast as I can. Once in a while there is a very usable ready-to-go idea. I love going back through old ones, to see which ones became finished projects. I’m sure no one will ever be able to decipher them…probably looks like something from A Beautiful Mind, but maybe it is ? Wow, how generous. Thanks for a chace to win. I’ve never used therofax sceens ut would to try. Thanks for the opportunity. I’ve wanted to try this. I keep a couple of small sketch books that are used sporadically when I’m out and about and an idea comes to me out of the blue. I might make a quick sketch or layout or even write down a quote I find meaningful. These are personal, almost like a diary, and sometimes result in finished art work. I was burned out on daily sketching by being forced to keep sketch books for multiple art courses at the same time. I’ve tried to love them again but so far I haven’t succeeded. Lyric, I love how accessible your blog makes your artwork and methods. I’m absorbing all sorts of inspirations as my husband make our way around the perimeter of the US. So much to see. I’m keeping a travel journal as well as a blog. Also have my sketchbook and watercolors and needle, thread and fabric. Thanks for the giveaway. The mountains, trees and sky here in western North Carolina inspire me. I keep an art journal as a play space – a small amount of sketching but a lot of collage and smears of paint and ink. Reading my email this afternoon and coming across travel deals made me think of the beauty we experienced in Italy. Funny how emails can inspire me…. I have a few sketchbooks. ONe in my car for notes and little pics I draw of things I find of interest on the road. I have another buy my computer for quick drawings and notes of ideas that enter my head while online. I have a beautiful large one for when I want to do some serious drawing. My yard with all the flowering bushes, birds, and butterflies inspire me. Going to a science museum, or art museum and Mancuso Bros World Quilt Show inspires me. I also love to go to online museums, especially Italian ones with old world paintings and drawings is also very delightful. I spent a glorious day on a river with my dogs – today is wall to wall sunshine in the 70’s here in Vermont . The beauty of nature is all I need for inspiration. My sketchbook gives me relaxation time sort if like a meditation or zen if you will . lovely. I crave art and do it with my girlfriend every week. I use my sketchbook to play creatively in a variety of mediums. Since I am the only one who sees my output, I can keep my critical gremlins at bay. It is a place to try anything I want, anytime I want, just for fun! I was unfortunately cleaning house today, so not much time for inspiration, although I’m always thinking while I am cleaning. Pondering the latest project, new project ideas, etc. But, I did take a break and watched The Quilt Show with Yvonne Porcella, so that was inspirational. I keep a few sketchbooks for notes, sketches, ideas, etc. I definitely think places are inspirational. I go out and take photographs in my yard, in the country where I bike, and from all of the places we have lived, like Alaska and Italy. The photographs are the inspiration of most of my artwork! Thanks for the great post and the fun giveaway! Words inspire me in my art. I rarely use a sketchbook as I compose my ideas in my head. But sometimes I do a few very rough sketches before starting. I also collect images from magazines, with my camera, from the web and save them in an electronic inspiration journal. Today has been a gray, rainy day in MN. I have been uninspired so am catching up on my emails. I am trying to get into my sketchbook and hopefully this blog hop will help me. I ready your blog regularly and appreciate all that you have to offer. I use my sketchbook to turn the ideas in my head into reality. It helps me take my visions to the next step. Sometimes, I realize that I need to do more work to realize my vision, sometimes it takes me somewhere else altogether. I am inspired to create by a deadline and a challenge. I just got into screen prints…even make a “real”one! Love your work. I use my sketchbook for everything from practice, practice sketching, to keep from losing my mind. I have never used a thermofax screen and would love the experience. I am sometimes inspired by the small details in everyday objects or the “big picture” of many objects.Sometimes it is only a sense or feeling and I use my sketchbook to write a short poem or a string of words to define that feeling. My sketchbook is my go to for jotting down ideas and new techniques learned, often using an art journalling approach to create a visual reminder with notations. I get an idea and I run to my sketchbook and start the drawing. I design my quilts that way and my jewelry. Someday I am going to make a great cover for my sketchbook so it looks way more interesting. See you in Blowing Rock! When I go back through my notes, sketches and photos, I can find themes that emerge without my knowing it happened. One of those themes that comes to mind is the pattern of light and shadow created by mini-blinds or anything else that lets light through in narrow strips, especially when the light hits a round surface and fun things happen. Hmm…a sketchbook is a good place to keep ideas when inspiration strikes and a big help when you’re stuck for ideas later. never surface using word journaling. I use a small pad in my purse so I have it with me all the time. It is perfect for the times when I get inspired by the simplest things. Seems like I’m spending more time on Pinterest these days the hours just fly by…then I have to go to my studio and create as soon as I can. My sketchbook is “sketchy” (meaning there isn’t a lot in it). I have done a little bit of drawing while on vacations and that’s about it. But I am retiring soon, and feeling very confident that I will have a lot more time for art. Lyric, it was so much fun meeting you and modeling one of your garments when you were at Desert Quilters of Nevada. You are an inspiration! I would love to try screen printing with one of your Thermofax screens. My sketchbook and journal travel everywhere with me. A few summers ago I added to my traveling companions a little plastic “suitcase” that holds a wrap filled with water color pencils, four different shaped/sized brushes with water reservoir for painting the water colors…double faced tape for attaching ephemera, a few oil paintsticks and pens and a handy little pair of scissors. Now when a poem or a bit of writing or something I just captured with my camera starts to sing me a song, I get busy with my “toolbox” of treasured implements and create a visual representation…and this often then gets translated into fabric at a later date. The fullness of expressing me grew wildly once I had made the commitment to bringing along with me this little collection whenever I headed out one an excursion of some sort. Having a place to put down the words and the visual inspirations has been the best ever gift to myself. I have not used a thermofax screen but would love to have the opportunity to do so. What a great giveaway. I am inspired by the view on my way into work, I have a lovely drive and the light on a nice day is just beautiful. Soon the leaves will be turning and that morning light will glow with orange and yellows, my favorite colors. I do love to spend quiet time also sketching nature and hope to have time to make all of the quilts I have in my imagination someday. Thanks for the interesting blog and give away. I have several sketchbooks. I do some sketching and a lot of writing. I try making different studies from the designs in different media. Sometimes it works, sometimes it doesn’t. I have just begun to carry around a sketchbook. Your blog always inspires me. I enjoyed following your trip. Your photos were amazing. I must admit I don’t use a traditional sketchbook but I do have places that I record my ideas, drawings, pictures and all sorts of things that interest me. Lyric I am taking your Screenprinting class at QU next week. I am so looking forward to it and have been collecting supplies and ideas. I have several sketchbooks that I use sometimes to explore ideas for an art quilt, sometimes to just capture a moment in nature, sometimes just drawing whatever my eye falls upon, and one that is dedicated to those “dry” moments when nothing creative seems to be stirring around in the old noodle. That sketchbook has an oodle of doodles and has become one of my favorites for referencing when I set about figuring out how I want to quilt a work. I will end by telling you how valuable your tutorial on editing in Photoshop Elements. Thank you so much for that posting. I use my sketchbook as a sort of diary documenting the art project I am working on that day. Sometimes it is filled with snippets of dyed fabric, sometimes with text I might include in a quilt and sometimes just a quick drawing of what I completed. I like to keep track of the past processes I used and this is a perfect tool for that. I have another sketchbook just for calligraphic practice and quotations. I am inspired by nature , hay bales, cornfields, and color but also by you and your always upbeat attitude. I love your new screens too. My sketchbook is a thumbnail into a bigger world that emerges into a giant art piece beyond my imagination with paints, fiber and threads. It meanders beyond a simple sketch on a page into valleys (challenges) and mountaintops (celebrations) into a life of its own on fabric. Once finished it breathes. I’m at a work conference today on the water in Bremerton Wa and inspired by the boats at the marina, sunshine and a beautiful Pacific Northwest fall day! I do use a sketchbook to jot down quick ideas for free motion quilting and ideas and or colors for quilting. I’m always inspired when I’m at the ocean or near water. What an awesome screen! I would dearly love to own one of these and would absolutely use and treasure it! Everything you do or create is so much fun and I am filled with inspiration and the desire to create! I have just returned from my childhood island home in Alaska. While the reason was very sad (the loss of my mother after 8 long, long years of Alzheimer’s Disease) it has also reminded me of my own resilience to life’s sorrows and how challenges can often spur us on to new discoveries and creative possibilities. Inspiration is everywhere I look! I have been a list maker and doodler for many years and quilt ideas are constantly being jotted down even as I awake in the night ! Nature , whether I am here in the blue ridge mts or strolling along coastal carolina’s crystal shores, provides all I need to create! I worked with silk screens throughout my college years and would love to utilize the thermofax screen in my next quilt so pick me please …and make my day! I have used a sketchbook off and on over the years, but lately I have gotten back into it. I love flowers, nature, objects, places, etc. I love using pen & ink along with watercolors, sketching casually. I have made a few cards lately also. You will be making a presentation for the Lake and Mountain Quilt Guild, Seneca, SC in early October and I will be there to meet you. I have signed up for your workshop and I am so excited! I also have your book. Love you work!!!! frequently to photograph inspiring shapes, patterns, color combinations, etc. Since my phone is with me almost all the time, it is easy to take a quick snapshot and handy when using paper and pencil/pen is inconvenient. I enjoy incorporating silkscreen and stencil images and patterns into my work. Is that print Mesa Verde? 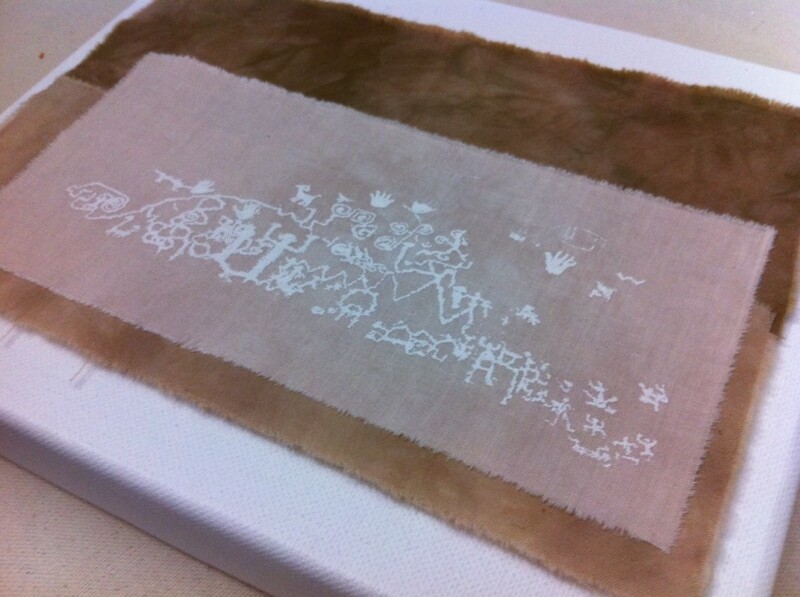 THose petroglyphs make great thermofax screens. Using a sketchbook is new for me. For most of my adult life I have made things from patterns that others have created. A 2012 trip to India with my adopted daughter, Jazmine, who was born in Kolkata (Calcutta) has been a huge inspiration. I feel so full of both experience and ideas! The sketchbook is a way to let my lifetime of experience and ideas bubble up to the surface so that I am finally creating and using my own designs! Will turn 65 on the 25th and feel like the best is yet to come! Wonderfully inspired drawings. Looks like you had fun doing this. I will check out your tutorial, too. Thanks. Today I was inspired by a blog that used recycled clothing for a baby quiet book. I want to make one for my friend’s child and it was so neat to see recycled clothes. Love your thermofax designs and that photo on fabric. Beautiful! Thanks for the opportunity to win. I always have several sketchbooks in the works and love to look back at the for inspiration. The Muse must be kept happy! Would live the chance to try thermafax screening in them. Hi Lyric. My sketchbook is in multiple pieces on varing scraps of paper or napkins. Done at spur of the moment inspirations from whatever I see that I think might be a great quilt idea, rocks, moss, leaves, flowers, color combinations in books, cards, and nature. I have used a few of these in my monthly quilting group of wonderful ladies on the Qualla Indian Reservation in Cherokee, NC. Now that I am semi-retired, I have time to give back to like minded women who like to be creative and are just starting their journey. Love your petroglyphs…..you inspired me to start using more photos (500 or so) from my sisters an my road trip from Seattle to Houston and back. I use a sketchbook to draw rough sketches of quilt ideas. I also make lists of words or feelings or colors that I want to convey with the quilt. This morning I was inspired by the colors and patterns in the 1-inch strips of fabric I am cutting for a log-cabin quilt. It’s very meditative and I work on this quilt when I am stuck on other projects that ask for a different kind of creativity. The solution always comes to me after a bit of structured work. Places definitely inspire me, but so do events. We are just recovering from the major flood in Boulder, Colorado. When I can bear to, I will use photographs of the patterns in the soil created by the flooding as inspiration for some surface design. Hmmm… wonder if I could create some Thermofax screens based on those patterns? Love this series…..I want to win! Today I was inspired by the cool breezes in the air! Fall is my favorite time of the year and LEAVES are one of my favorite subjects….The trees are just starting to yawn and fall from the trees…I love to gather them and make prints with acrylic paint and ink into my sketchbooks they became some great thermofaxes! I would like to use more Thermofax screens in my work, so I welcome the opportunity to win one from you. I AM inspired by the places I visit. We visited Italy last year, and the colors of Tuscany will definitely inspire some of my future work. Your Southwestern art has inspired me! I love what you are doing and can’t wait to see where you go with it. I used to use a sketchbook — then I started cutting out pictures from magazines that inspired me. It’d be good to get a pen or pencil back in my hand, however. What inspired me today… I work in a very tall building in downtown Chicago. On the east side of Michigan Avenue, on the 33rd floor, I can look south and see the amazing skyline, the gorgeous lake, and it’s just clear enough to see Indiana, way over on the other side of the lake. The shapes fascinate and excite me. The different colors and textures that the windows make cause me to consider how to represent that in textiles. I’m fascinated with screen printing and mono printing on gelatin. Thermofax printing is the next step! Would love to win your screen. Enjoyed your trip posts. I’ve been a “westerner” for over 40 years and love the richness of the west. Glad you and your family got to experience some of it. My girls always remember our tour of 17 national parks and monuments in 3 weeks. It makes an impression. I don’t always use a sketchbook, but really want to start… I am always inspired by places I go, especially old architecture (old barns, etc) and gardens I visit. My biggest inspiration is right in my own back yard… and front yard, side, yard, etc… My gardens and the gorgeous view of rolling mountains. Today’s inspiration is a pergola over my sister’s deck with a bright blue sky over it while I am visiting. I have always admired the prints you do with your screens! I love these. I have always felt drawn to the Southwest and the art of the Southwest speaks to me. Thanks very much for your wonderful blog!! I have done some fabric deying today, so that was very inspiring. These fabrics will be great for thermofaxscreens screens. Fingers crossed! Too early for any inspiration this am. I am inspired by nature. We recently took a trip to Canyonlands and it was so wonderful! I love the red rocks! I don’t really use a sketchbook. I think I should and just don’t do it. Sometimes I will pull out my little notepad and draw a few simple lines to remind myself of something that intrigued me. I really am hoping to get into some new techniques, I would love to try thermofaxing! I am inspired by the nature around me. I love to dissappear into my studio and just zone out and work. Your work is inspiring to me. Have a great day. I have only recently started using a sketchbook. I have shoeboxes of sketches I have made on pieces of whatever paper was available at the time, and now my sketchbook is very rarely not close at hand. Places have always inspired me and I have visited many grand and many more down-home places in my life. Where people live has always been of more interest than the grand public buildings and sometimes I just sit and look and imagine what it was like to live there. Thank you for the challenge of your questions. My answers have given me much to work with. Lyric, I do keep a sketchbook but nothing like yours! I draw out ideas for quilts, paste in it snippets of things from magazines… I try to keep my camera with me as well for any quick shots that inspire me. I recently starting dyeing fabric and would love to play with the thermofax screens next! Thank you for the chance to win! Lyric, you inspire me! I have a sketchbook with many messy bits of this and that. I like to take photos but I know that sketching is good for my focus and slows me down to allow me to catch up with myself. My art group has been making 12 x 12 theme quilts and my water quilt was inspired by hiking The Narrows at Zion. i love my sketchbook… many happy hours there i spend, inspired by montana landscapes, flowers… and color galore. thanks for the chance on the giveaway, and i’m off to check out your screens. thanks for the tutorials… on the wish list someday! inspiration is everywhere! montana landscapes… flowers… gelli plate prints… thermofax screen! i would love to have a thermo made from a drawing, and the time i spend in my sketchbook is just a little slice of heaven for me!! I took your screen printing class through QU and loved it! It was my first experience with screen printing. Thanks for all of your great comments! I keep a sketchbook and often design my art quilts using it. I also take lots of photos of nature; mostly as close-up shots to get ideas for shape and texture. Looking at one of my unfinished quilt projects inspired me today, so I worked some more on it. Didn’t finish it, but getting closer each time I work on it. I use a sketchbook some, but not as much as I’d like; just haven’t quite got the habit yet, but I’m working on it. Your giveaway is a very generous one. Oooooer…I just love these primitive glyphs. Thanks for the tutorial links too. Hummingbirds everywhere, at the feeders, on the hyacinth beans vines, and the red flowerd vine whose name I can never remember. The weather has cooled just a bit. The birds and I all love it. We are waiting for rain ( I have more time in the studio because I dont’t need to water) and the fall season my favorite. Back to the studio I’m almost finished quilting a bright happy splash of color for the dining room. 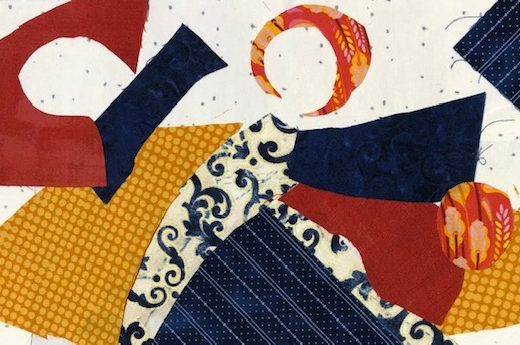 Today I was inspired by a new episode on “The Quilt Show” featuring Angela Walters and Sheila Frampton Cooper. I’m off to practice my free-motion quilting – but my favorite artform is still Thermofax screen printing. I love the photo you printed on fabric. Will you please post again later so we can see where it takes you? I have too many sketchbooks and lose track of what’s in what!!! But I love looking at them after time has passed to see my progress and for inspiration for future projects. Love your sketches. I do use sketchbooks – for my work and for fun!! Today, I have been inspired by your post and the links on how to use a Thermofax screen. I learned something new, and it looks like a lot of fun. I always enjoy your posts at the Sketchbook Challenge. Ooooooh! My favorite part of this country … the west! I love stitching from my photos taken there. I am a day away from finishing a small piece that are the petroglyphs from McKee Springs in Dinosaur National Monument in Utah … the one pictured first in your post (not Mesa Verde, LOL). I’ve only worked with thermofax screens once before, but would love to play with them again! Can’t wait to see what you do with the Mesa Verde piece! you are right – the first petroglyphs were from a book I brought back with me the second from my own photograph. I’d love to see your work when it’s done too! Well, I didn’t finish it yesterday as planned. New puppy demanded too much of my time. That’s happening a whole lot lately! Can’t stitch with a dog on my feet. Send me your email and I’ll send you a photo … hopefully today??? Today I was inspired by the wet, wet dirt of the slo pitch field. So wet the batters were bunting to the puddle in front of the pitchers mound. I have a sketchbook, but haven’t used it in months. Must get it out and brush the dust off it. Places most certainly inspire me, and also the changing of the seasons too. I am so envious of your trip. We did 4 trips down the Colorado River in our boat back when we were young. The historic people and the marks they left really was amazing. To imagine living in one of the cliff dwelings is humbling. I love this new series and look forward to following along. Thunder storms were my inspiration today. The way the air changes, the clouds, the drama, really Mom Nature putting on a show. I’m working on using a sketchbook more. I’ve amassed a collection of feathers over the summer that I would like to incorporate. 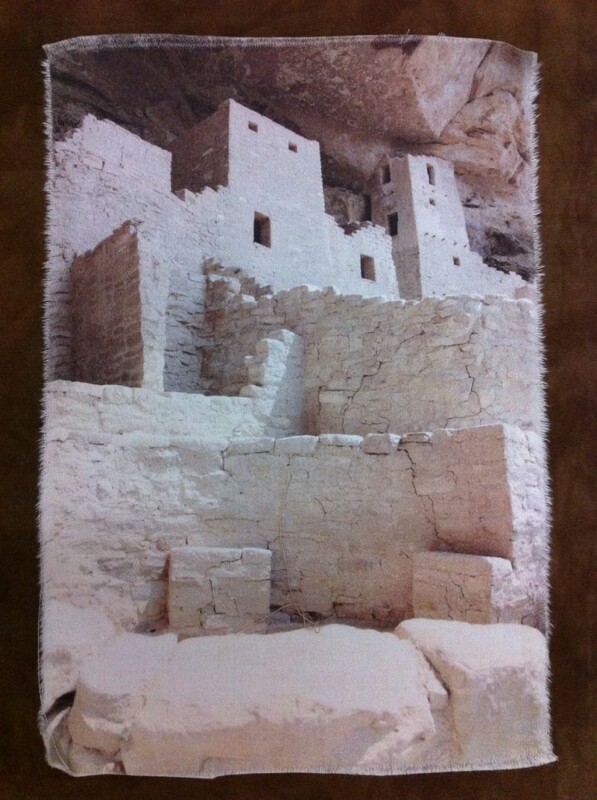 Love the photos of Mesa Verde. I was there well over 30 years ago and still am fascinated by it. I was inspired today by Jane LaFazio. I’m taking her online workshop on drawing and watercolor painting. I made a small watercolor of some leaves and I am daydreaming about what object I will try to draw and paint next. Meanwhile, I would love to try screenprinting with one of your ready-made thermofax screens. Thanks for the giveaway! I spent a couple of decades in the high desert mountains north and south of Santa Fe and loved the earth architecture and pueblo-style living there. Had to move back to the mountains around Asheville to take care of my Mom — green and very beautiful in different ways, but photos like yours always take me back to my years in the Land of Enchantment. And it sounds hokey, but there really is something to the qualities of light and the open skies that make for truly inspiring mountain vistas and double rainbows! I do some silk-screening with an old Print Gocco, but haven’t experimented with Thermofax at all yet. Since I’m teaching Graphic Design as an adjunct instructor now, I like to find new things to turn my students on to exploring different art forms. About to go back to your tutorial. Thanks! Your trip took you across some country that is very familiar to me, having lived in those areas. They are a nostalgic memory. I’ve always loved creating buildings in fabric, especially houses as they usually tell a story about the life that happens in them and around them. Your inclusion of the historic mesa dwellings adds another dimension. I also love working from travel photographs. So much inspiration is out there to fill our hours with creativity. Creating a thermo fax screen from one of those photos / sketches would be exciting! Thanks for your Sketch Book Challenge! I’m new to quilting and mixed media arts. Both fascinate me. I’m disabled because of arthritis so I don’t get out much. At this point my inspiration comes from online . I have always doodled (mostly simple shapes filling in with shading). I don’t consider myself an artist but do enjoy scribbling/doodling. Your art is very inspiring! 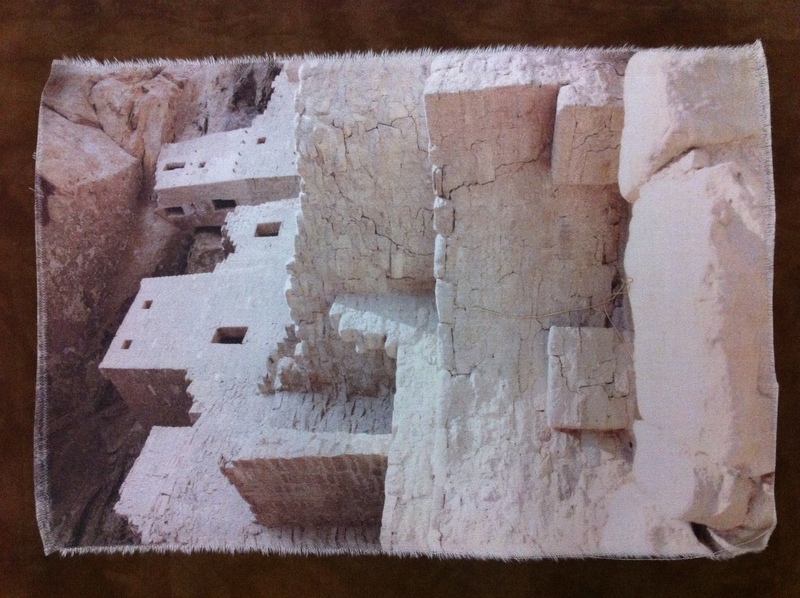 I love the Mesa Verde prints – will have to dig mine out. I’m in Colorado so today and this week I’ve been inspired by the transformation of a tiny raindrop into a raging torrent. Don’t know if it is awe-inspiring or terrifying. And its raining again. I keep a sketchbook, but don’t work in it nearly as often as I probably should. Your artwork and thermographs are inspiring. I’ve found that roadtrips (our family took a 5,000+ mile roadtrip this summer in 2 weeks!) inspires me…the change of scenery lights up my imagination and helps the creative flow. Thanks for sharing your photos and artwork, the last one of the abandoned dwellings is especially beautiful to me. Love your petroglyphs! I use a sketchbook for a lot of my art quilts but sometimes I start from a Gelli print. I’m always inspired by the places I’ve been. I really, really enjoy hiking to petroglyphs. I always stare and wonder what message they were leaving behind. What will future generations think of messages I leave behind? Will they understand them? Thanks for sharing your trip with us. Fabulous country and history in our SW. I’ll continue to check your blog and progress along with more information regarding thermofax screen printing. Wonderful inspiration! I love architecture and that is some feat to build there. You have inspired me to go back through the petroglyph photos I have from our trip to Moab, UT several years ago and mine them for images for screen printing. Your idea for using my photos on a thermo fax screen has inspired me today! Enjoyed your post and peak into your sketchbook! Loved your post at Sketchbook and the creative work you have done, inspired by your trip. I suppose I am inspired by nature and my travels. I take hundreds of pictures of flowers and skies especially. I keep wishing I kept a sketchbook, but I never make the time for it – other than a few scribbles when I’m working out a design. I do take lots of photographs, however, and am working on incorporating them into my art. I’d love to play with a Thermofax screen and try a new technique. When I travel, the things that inspire me can be the cultures of the far away places, the moods of the weather, the textures of the rocks and the plants. And the challenge is to put it all together; to capture it in fabric and fiber. Oh my… that sounds like an artist’s statement. Thanks for opportunity to win a thermofax screen. I am always jotting things down sometimes in note books, often on pieces of paper. I am constantly inspired by shapes and colours. The shapes in the Peublo homes are very inspiring, squares, rectangles part shapes. yum! Picking up my camera lately has been inspiring. I start looking at things differently when I have a camera in my hand. There is texture and pattern everywhere. There also is no rhyme or reason for some of the pictures I take. My husband doesn’t understand this but that’s ok. Neither do I sometimes. LOL. Right now it’s fun and that’s all that matters! What inspires me to create, is my morning routine of looking at my blogs and Facebook sites. 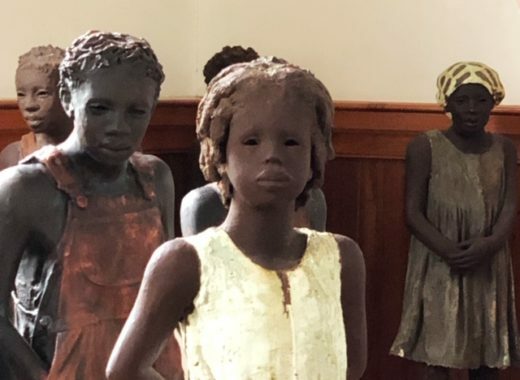 While I know that I could never do these amazing, beautiful work that I see, just looking at these pieces inspires me to work at creating something. I love the colours, the variety of techniques and the stories that go with them. I do use a sketchbook and would be lost without it – I also keep little notes of ideas by my computer – and enjoy looking back at them for more inspiration. I love your photos of the petroglyphs from Mesa Verde. See ! I’m inspired already this morning – just by looking at them. Thanks!